Things are heating up fast in the digital payments space. Since the demonetization announcement on 8th November, wallet companies such as Paytm, Freecharge and Mobikwik have been scrambling to gain marketshare. Their biggest push has been on offline transactions, they’ve been trying to gain acceptance at small shops across the country. Now a big new player is looking to eye the same market. 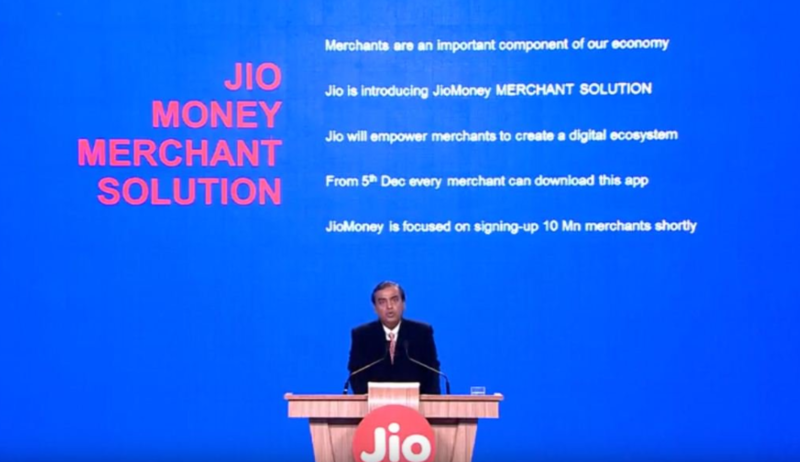 Reliance Jio has launched its JioMoney Merchant app, which will allow any merchant with the app to start accepting money from JioMoney wallet users. Beginning 5th December, merchants will be able to download the app, and begin accepting payments. Reliance has announced that it plans to sign up an ambitious 10 million merchants shortly. This is in direct competition to wallet startups, who’d found growth to be saturating in the online world, but were presented with a great offline use case thanks to the cash crunch that followed the demonetization move. JioMoney might not have the user base that Paytm commands, but it has other advantages – thanks to the Jio phone ecosystem, Reliance will be well positioned to push its payments solution on its 4G phones. And that’s an advantage that none of the other wallet companies have – Reliance controls several million devices that enable payments, and can use it to further the use of JioMoney. In the announcement, Reliance also said that it will be extended the free data usage on the Jio network till 31st March 2017. “On average, a Jio customer is using 25 times more data than the average Indian broadband user. In 83 days, Jio has added 50 million customers on its 4G LTE all-IP wireless broadband network,” said Mukesh Ambani. Reliance seems to have realized that these are times of great churn in the digital ecosystem, and is doubling down on its Jio play. These is a crucial period for all fintech companies in India – their moves over the next few months might well determine their positions in the years to come.